President Obama plans to appear on Comedy Central’s “Daily Show” shortly before the midterm elections, a senior White House official tells CBS News, in what will be his first appearance on the show since becoming president. The appearance will be on Wednesday October 27th. It comes shortly before both the November 2nd midterm elections as well as host Jon Stewart’s “Rally to Restore Sanity” on the National Mall on October 30th. The president has been trying to rally the sort of young voters who watch Stewart’s show to come out to vote in the midterm elections amid signs that they are less enthusiastic than they were two years ago. Democrats are trying to hold the House and Senate amid predictions of a potential wave election for Republicans, and among his campaign stops in the midterm cycle have been appearances at college campuses. 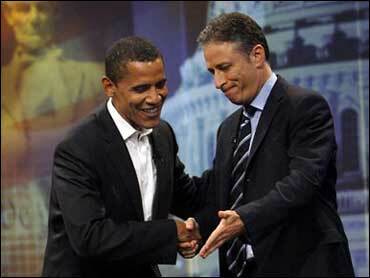 While he has appeared on the show as a candidate, this will be Obama’s first appearance as president. The NAACP has released a 94-page report on bigotry and anti-Semitism among those who receive a platform from the Tea Party movement. “These groups and individuals are out there, and we ignore them at our own peril,” said NAACP President Benjamin Todd Jealous. “They are speaking at tea party events, recruiting at rallies, and in some cases remain in the tea party leadership itself. The report, “Tea Party Nationalism: A Critical Examination of the Tea Party Movement and the Size, Scope, and Focus of Its National Factions,” was written by Leonard Zeskind and Devin Burghart of the Kansas City-based Institute for Research and Education on Human Rights. Zeskind and Burghart examined government documents and databases, including court cases, campaign finance reports and corporate filings. •The St. Louis-based Council of Conservative Citizens, the largest white nationalist group in the country, has both led and promoted tea party protests. Roan Garcia-Quintana, a member of ResistNet who served as media spokesman for a 2010 Tax Day Tea Party in South Carolina, is on the national board of directors for the Council of Conservative Citizens. •Clayton Douglas, a former information officer for the New Mexico Militia, is a member of the ResistNet tea party. He uses his profile on the ResistNet website to advertise his own “Free American” website, on which he promotes anti-Semitism. •The Wood County Tea Party in Texas is led by a woman who used to be involved with the Knights of the Ku Klux Klan. •The 1776 Tea Party — also known as TeaParty.org — is led by Stephen Eichler, executive director of the Minuteman Project, an anti-immigrant border patrol group often referred to as vigilantes.